See in Glossary are rendered. Sort Order Set the direction that Tiles on the selected Tilemap are sorted from. See in Glossary mode of the Renderer. Chunk The Renderer groups Tiles by location, and batches their Sprites together for rendering. Select this mode for the best rendering performance with Tilemap. See in Glossary or with a Custom Sorting Axis. Detect Chunk Culling Bounds Determines how the Render detects the boundsThe coordinates that define the bounding volume. Bounds are pre-calculated on import from the Mesh and animations in the model file, and are displayed as a wireframe around the model in the Scene View. See in Glossary used for the culling of Tilemap chunks. These bounds expand the boundary of Tilemap chunks to ensure that oversized Sprites will not be clipped during culling. Auto The Renderer automatically inspects the Sprites used by the Tiles to determine the expanded culling bounds to use. Manual The values used to extend the bounds for culling of the Tilemap chunks are manually set instead of with the Editor’s automatic detection. 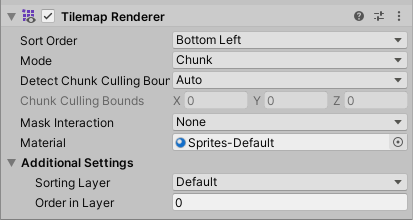 Chunk Culling Bounds (when ‘Manual’ is selected) Input the values (in Unity units) that the culling bounds are extended by. Sorting Layer Set the Sorting Layer of the Tilemap. Select an existing Sorting Layer from the drop-down box, or create a new Sorting Layer. Order in Layer Set the render priority of the Tilemap within its Sorting Layer. Lower numbered layers are rendered first. Higher numbered layers overlap those below. None The Tilemap Renderer does not interact with any Sprite Mask in the Scene. This is the default option. Visible Inside Mask The Tilemap is visible where the Sprite Mask overlays it, but not outside of it. Visible Outside Mask The Tilemap is visible outside the Sprite Mask, but not inside it. The Sprite Mask hides the sections of the Sprite it overlays.